The Appeal Court on Wednesday sentenced a 66-year-old bookseller to three years in jail under the lèse majesté law for selling a banned book with the jail term reduced by one third. Bangkok’s Southern Criminal Court on Wednesday morning overturned the Court of First Instance’s ruling to acquit a defendant accused under Article 112 of the Criminal Code, known as the lèse majesté law, and sentenced him to three years imprisonment. The defendant prefers to be referred to as defendant U. due to privacy concerns. The jail term was reduced to two years because the defendant was cooperative during the trial. However, the court did not suspend the jail term. After the ruling, the defence lawyer said that he will submit a bail request to the court. Defendant U. was accused of selling the banned book ‘The Devil’s Discus’ at pro-establishment yellow-shirt rallies in 2006. 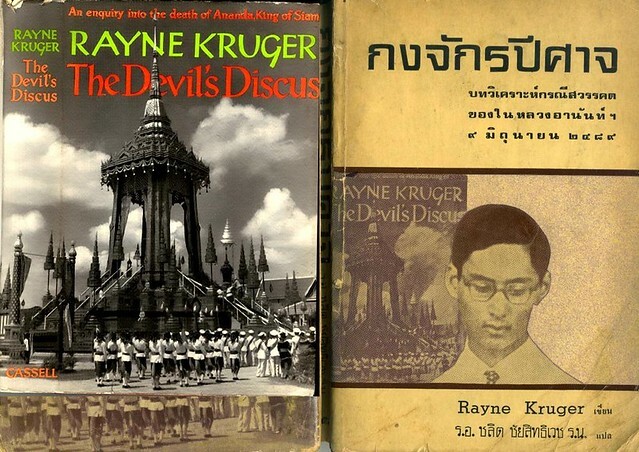 The book, written by English-South African author Rayne Kruger and published in 1964, was declared illegal by the Thai authorities in 2006. It was translated into Thai by Chalit Chaisithiwet and a Thai version was published in 1974. According to Wikipedia, as soon as the book was published, it was banned in Thailand and Kruger was also banned from further entry to Thailand. On April 2014, the Court of First Instance ruled that the book had content defaming the King, and the writer, Rayne Kruger, intended to insult the King. But the Court then acquitted the defendant because the prosecutors failed to prove that the defendant had knowledge that the book had lèse majesté content. In contrast, the Appeal Court on Wednesday ruled that the defendant’s claim that he had no knowledge of the book’s content was not credible because the defendant had been selling books at political gatherings since 1994. Moreover, at the time of arrest, the defendant was also selling a copy of another banned book, “Monarchy and Thai society”, the Oct-Dec 2005 issue of the Same Sky journal (the Coca Cola issue), which is banned under the now-abolished Printing Act. The 66-year-old defendant is a bookseller who normally set up temporary book stalls at events and street markets. He was arrested when selling books at a People’s Alliance for Democracy (PAD) gathering at Lumpini Park on 2 May 2006. Article 112 of Thailand’s Criminal Code is one of the harshest lèse majesté laws in the world. It stipulates that "whoever defames, insults or threatens the King, Queen, the Heir-apparent or the Regent, shall be punished with imprisonment of three to fifteen years."